What does `almost any how` mean? I don't quite understand it, especially this phrase almost any how. Can somebody please shed light onto the meaning? can bear almost any  MANNER  of life. If you have a reason or purpose in life, you can endure almost any misery. Hat man sein w a r u m ? des Lebens, so verträgt man sich fast mit jedem w i e ? – Der Mensch strebt nicht nach Glück; nur der Engländer thut das. There are no quotation marks, but warum? (why?) and wie? (how?) are letterspaced. This is a common emphatic device in German orthography; Bernard Shaw was fond of it, too. Some contemporary writers follow another of Shaw's favorite uses with embedded quotations and capitalise these terms (Warum? Wie?) instead; but in German this marks them as nouns. If you have your Why? of life, you can put up with just about any How? —Man doesn't strive for happiness; only the Englishman does that. He who has a 'why' to live can bear almost any 'how'. He who has a reason to live can bear almost any problem. 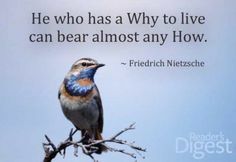 He who has a why to live can bear almost any how to live. He who has a why-to-live can bear almost any how-to-live. What is "a why-to-live"? Idiomatically, "a why" is a reason, so this means a reason to live. Thus by parallelism (and this is not idiomatic) "a how" is a means, and "any how-to-live" is "any means to live". He who has a reason to live can bear almost any means of living. Nietzsche means that a person with nothing to live for subconsciously prefers death, but someone who has something to live for (the reason WHY he continues to live) can endure almost anything (HOW to survive almost anything). Victor Frankel's, "Mans Search for Meaning" Will explain this quote absolutely. While living through Auschwitz, Frankel discovered that those victims who had meaning in their lives were far more likely to survive than those who did not. When EVERYTHING is taken from you, leaving no possibility of any kind of normal "happiness", if you still had a sense of "why", a sense of meaning, will get you through the day. I actually found this quote when trying to understand the importance of the simple question 'WHY' in the workplace. My interpretation of this basically - If you can understand why a thing needs to be done, your solution or 'how' will be strategic to reach the goal of why the thing needs to be done, not just doing it. What does “Earthly knowledge is but shadow” mean? What does “quote unquote” mean? What does “Never do yesterday what should be done tomorrow” mean? What does the quote 'Those things that hurt, instruct' mean? What does “run for” mean?